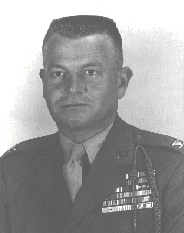 Brigadier General Donald M. Schmuck, holder of two Silver Stars, severed as Commanding Officer of the 1st Marine Division's 5th Marines at Camp Pendleton, California. This was his second tour with the 1st Division, having served as the Commanding Officer of the 1st Battalion, 1st Marines, during the Chosin Campaign, and later as the Regimental Executive Officer of the 1st Marines and the Assistant G-3 for the 1st Division in Korea. Born 16 August 1915, the Colonel attended South High School in Denver, Colorado. Commissioned a second lieutenant upon graduation from the University of Colorado in 1938, he attended The Basic School at Marine Barracks, Philadelphia, Pennsylvania and was subsequently assigned as a platoon leader in the 1st Defense Battalion. During World War II he served in various command billets throughout the Pacific, including Battery Commander in the 2d Defense Battalion; Rifle Company Commander in the 3d Marines, and Infantry Battalion Commander in the 4th Marine Division. In 1944 the Colonel was assigned as Assistant G-3 for the 10th Army on Okinawa. After World War II, he attended the Senior Course, Amphibious Warfare School, Quantico VA, and was on the staff of this school for three years. After his Korean duty, General Schmuck was assigned as the Assistant G-3 of Fleet Marine Force Pacific, Commanding Officer of the Cold Weather Training Center, Bridgeport CA, and three years in Washington D. C. There he was Head, Operations and Training Branch, G-3 Headquarters Marine Corps. In addition to two Silver Stars, General Schmuck wears the Legion of Merit, Bronze Star with one star, Air Medal, Navy Commendation Ribbon, Purple Heart with one star Presidential Unit Citation with three stars, Navy Unit Commendation Ribbon Asiatic-Pacific Campaign; Medal with five stars World War II Victory Medal, National Defense Medal, Korean Presidential Unit Citation. The General resided with his mother, Mrs. Alice B. Schmuck, in the Camp Pendleton Officers’ quarters. Donald M. Schmuck, 88, of Honolulu, a U.S. Marine Corps Brigadier General and Dillingham Corp. Business Development director, died in Tripler Army Medical Center, Hawaii. He was born in Denver. He is survived by brother Carl. Services to be held at a later date. Brigadier Gen. Donald M. (Buck) Schmuck, 88, of Sheridan and Honolulu died Saturday, Jan. 24, 2004, in Tripler Army Hospital in Honolulu. Funeral services will be this spring at Arlington National Cemetery. General Schmuck was born Aug. 16, 1915, on the family farm in Woodford, Ill. He grew up in Denver and on the family ranch near Walden, Colorado. He attended the University of Colorado and the U.S. Coast Guard Academy. He enlisted in the Marine Corps in 1935 and was commissioned a second lieutenant in 1938 following graduation from the University of Colorado. After basic school, he served as a platoon leader at San Diego Marine Corps Base. He served in the South Pacific with the 2nd Marine Brigade during World War II, seeing action in Guadalcanal, Vella Lavella, and Bougainville as a rifle company commander. He was hospitalized briefly from injuries sustained in Bougainville. He then joined the 1st Marine Division in time for landings on Pelelieu and, later, Okinawa, where he was again wounded in action. He was a lieutenant colonel commanding an infantry battalion training for the invasion of Japan when the war ended. He attended the Amphibious Warfare School at Quantico, Virginia, and the Army Airborne School at Fort Benning, Georgia, then did a short tour with the 82nd Airborne Division at Fort Bragg, North Carolina, before returning to Quantico as an instructor in the Marine Corps Schools. In 1949 he was ordered to the United Nations Middle Eastern Commission and was active in Lebanon, Israel, Jordan, Syria, Egypt, and Iraq. He joined the 1st Marine Division at the start of the Korean War in 1950. He was assigned as commander, 1st Battalion, 1st Marines under the regimental command of Col. Chesty Puller. He led the 1st Battalion in action during 1950 and 1951 including the Chosin Reservoir operation and the Spring Counter Offensive. He served as regimental executive through the Summer Offensive. He served with the Fleet Marine Force Pacific at Pearl Harbor after Korea. During that duty, he was charged with producing a number of contingency war plans covering national objectives in Asia, including several locations in Vietnam, and he conducted the in-country reconnaissance required for those plans. In 1959 he attended the Army War College at Carlisle Barracks, Pennsylvania. He retired from the Marine Corps in 1960 with the rank of brigadier general. He continued to be active in special missions in Central America, Vietnam, and Laos. He completed a Ph.D. in nuclear physics at the University of Colorado-Boulder in the early 1960s. He was a military observer during Desert Storm in February 1991 in the Gulf War. His decorations include the Navy Cross, two Silver Stars, the Legion of Merit with combat V, two Bronze Stars with combat V's, three Purple Hearts, the Air Medal, the Navy Commendation with combat V, the Presidential Unit Citation with five battle stars, the Navy Distinguished Unit medal and numerous foreign decorations and campaign medals. He was active with the Marine Corps League in Wyoming and Hawaii and was a founding member of the Vietnam Veterans Motorcycle Club. He purchased the Triangle-S ranch between Buffalo and Sheridan in the 1960s and spent summers at the ranch and winters in Honolulu. Survivors include a brother, retired Cmdr. Carl Schmuck of Anacortes, Wash., and numerous nieces and nephews.